Orthoptics is a well established profession. Orthoptists work within the subspecialty field of ophthalmology. Orthoptists have been working in the United States for over 75 years. Orthoptics is an ophthalmic field pertaining to the evaluation and treatment of patients with disorders of the visual system with an emphasis on binocular vision and eye movements. Orthoptists are uniquely skilled in diagnostic techniques. Orthoptics is a versatile field with opportunities and responsibilities in a variety of clinical settings. Orthoptists may serve their communities in private ophthalmology practices. Others may work in hospital or medical university settings with involvement in patient care, academics and clinical research. Orthoptists may serve as directors or advisors of state and local vision screening programs. 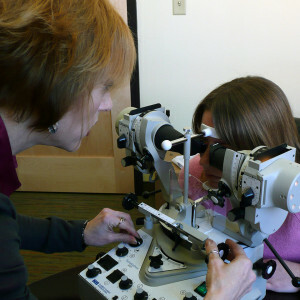 Orthoptists commonly work in pediatric ophthalmology settings. Orthoptists serve patients of all ages, but because of the nature of many binocular disorders, many of patients are children. Adult care in the field of Orthoptics is uniquely challenging and rewarding, found in settings of ophthalmology specific to neuro-ophthalmology and adult eye muscle disorders. Orthoptics offers opportunities for dynamic individuals who desire to exercise leadership ability and for those who enjoy involvement in a professional organization. The American Association of Certified Orthoptists (AACO) is a membership organization with a mission to promote and advance the professional and educational competence of orthoptists. The AACO is governed and administrated by member orthoptists.